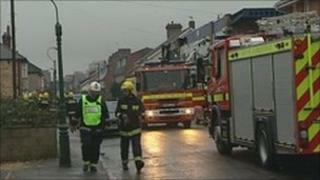 A Dorset community recycling charity is "rising from the ashes", one year on from an arson attack, says a spokesman. Arsonists set fire to a warehouse, run by Dorset Reclaim, on Stanley Road in Bournemouth in January 2010. The blaze ruined hundreds of items of furniture, fridges and other household goods, donated by local people and destined for families on low income. The charity now has a new depot called Phoenix House on the same site as the one which was destroyed. "It's a much brighter future," said: Stefan Drummond, a volunteer fundraising manager for Dorset Reclaim. The building is used as the headquarters of the charity, which has four other premises in Dorset - three further depots and a charity outlet. The outlet was opened at the beginning of March as a temporary location, but a spokeswoman said it is now being kept on by the charity. Joanna Taylor, Dorset Reclaim's policy and development manager, said: "The outlet is open to everyone and sells surplus stock from the current Dorset Reclaim depots, as well as unusual household items. "This allows us to take in more donations and stops even more furniture from going to landfill, instead of being recycled." The charity, which was set up in 1998, has saved 45,000 tonnes of unwanted household items from going to landfill and has helped 24,000 households. In the past 10 years over 100,000 items have been distributed. Ms Taylor added: "In the depots we have just set up wood stores - our volunteers are now making recycled products from unwanted timber." Following last year's fire £80,000 worth of income was lost, and 15 people were made redundant. Ray Tovey, project manager for Dorset Reclaim, added that about 400 beds, 50 three-piece suites and up to 100 appliances had been destroyed, as well as computers and office furniture. Residents living close to the scene were evacuated from their homes for more than two hours when the fire broke out inside the two-storey building. Dorset Fire and Rescue Service said that the building was "unstable" and some brick pillars were coming away from the structure. Mr Tovey said: "[It was] heartbreaking. I just can't describe in words [what it felt like] when I saw 13 fire appliances putting that much water into this building and just not knowing what was going to happen. "I was devastated, but not now. Dorset Reclaim is ready for business again." The charity operates a free collection service of unwanted household goods in Dorset and West Hampshire.